The first in what will believe me be a short series. 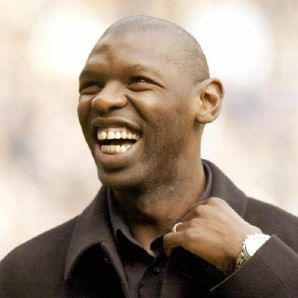 Clearly recognisable by his charming smile I often see Shaun Goater driving his kids to school or just hanging out talking to some of the locals. There is no hero- worshipping here though despite his achievements elsewhere, Goater is more respected than revered by Bermudians. Born in Court Street in Hamilton in February 1970 Leonardo Shaun Goater grew up in a houseful of women during a socially tough time for Bermuda. Brought up by his mother, grandmother and a couple of Aunties this didn't restrict his interest in football and he would play at every opportunity on any open space he could find. Goater was offered scholarships in the USA at both Colombia University in New Jersey and Wake Forest in North Carolina, which has an excellent history in sports, especially football but during an autumn break back in Bermuda playing in midfield for North Village against some travelling English youth teams, Goater got spotted by scouts from Man Utd. Encouraged by his football-obssessed Mum and well known Bermudian football coach Andrew Bascome, Goater at 18 left his tight family unit and travelled to Manchester for his trial, and thus forfeited his scholarships. "Once I agreed to the trial I had forfeited my scholarship because I was deemed to be a professional. Looking back, it was a huge gamble that I took. I don't know what I would have done had it not worked out. I was confident that this was what I always wanted and knew that if I had turned it down, I could have spent the rest of my life wondering what might have been." Shaun played two games on trial scoring once and Alex Ferguson gave him a contract. However his work permit took forever and Goater couldn't get anywhere near a first team that included Brian McClair, Mark Hughes, Danny Wallace, Bryan Robson and one Ralph Milne! One thing that did happen for Shaun though was his conversion from a creative midfield player to a striker but after less than a year he moved to Rotherham United in the 3rd Division for an opportunity to play first team football. However Shaun was missing home and was struggling with the English weather. "It took me a good two years to get used to life in England. At first I thought the sun never shone and it wasn't for me. 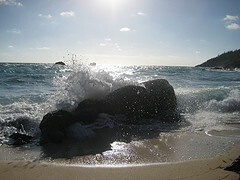 I found it hard to get used to life but gradually I accepted what the country had to offer." But Goater made a lot of friends in Yorkshire and spent seven seasons at Rotherham. He learnt too even at Millmoor that professional football was a team game. In Bermuda he was a one man show, easily the best player on the island but not so in England. He had to buckle down and take the game more seriously. He was told at Man Utd that: "If you smile the next time you miss another chance, you will be on the first plane to Bermuda." He made himself a good reputation at Rotherham as a striker who could score goals in the lower leagues. 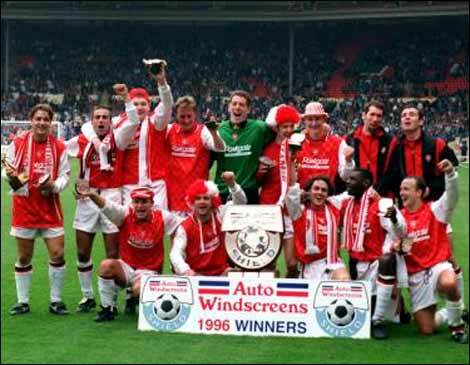 He scored 86 goals in 262 games and played at Wembley in the 1996 Auto Windscreens picking up a winner's medal as The Millers beat Shrewsbury 2-1 (right). He fell out with manager Archie Gemmill though during that 95-96 season and decided to move on. He was now married to his childhood sweetheart Anita and had gotten used to the English weather so despite offers from Spain and South Korea, Goater chose Bristol City. It was Joe Jordan at Ashton Gate who finally lured Goater away from Millmoor for a fee of £175,000 and City began the 1996-97 season as one of the favourites to win promotion. City finished 5th and reached the play-offs only to lose to Brentford. Goater got another 24 goals. The next season City did win promotion but by March after scoring 40 goals in 75 matches Goater had left Ashton Gate and won his dream move to Maine Road. It was the beginning of a beautiful relationship. At home on deadline day Goater waited by the fax machine to get confirmation of his £400,000 move. He remembers the machine jamming and the clock ticking past 5pm but he was thrilled when Joe Royle finally got his man. The thrills didn't last and the trouble was whilst Charlton were on the verge of a play-off place and that game at Wembley, Man City were about to drop down to the 3rd tier to replace the Bristol City team Goater had just left and despite scoring twice in a 5-2 win at also relegated Stoke on the last day of the season City dropped to it's lowest level of their 105-year history. That was a tough summer for Goater with the whole club in the doldrums but City won promotion straight back but only after a dramatic two goals in the last minute took the play-off final against Gillingham into extra time. City beat the Gills on penalties 3-1. Goater scored 21 goals in that promotion season and he won over sceptical Blues fans, which seems ridiculous bearing in mind his scoring prowess. Goater felt that Paul Dickov was too popular for City fans to find room in their hearts for him, but another blistering start to the 1999/2000 season saw the famous chant of "Feed the Goat and He Will Score" start to reverberate around Maine Road. Around Maine Road Goater was always the one player who was happy to talk to the local press, meet the fans, walk into the schools, sign a kid's autograph book. Never forced it was a natural part of who he is. As Man City won promotion for the second consecutive season, this time to the Premier League, finishing two points behind champions Charlton, Goater scored 29 goals (including both against us) and City were back in the big time. But for Goater it was his first experience of top flight football and as he wrote in his biography 'Feed the Goat' he noticed changes. "In came the big names (Paulo Wanchope and George Weah had both signed). I saw families wanting an autograph get ignored as the stars headed to their flashy cars. I am there thinking 'well. why not sign them.'" That summer of 2000 Shaun was awarded with the Freedom of Bermuda and 5,000 people lined the streets to welcome him. I expect in those days a lot of City shirts would adorn Hamilton on a Saturday afternoon, today it is mostly the red of United. City were relegated in their very first Premier League season and despite missing the beginning of the season to injury Goater still ended the season City's top scorer with 11 goals. Joe Royle carried the can and was replaced by Kevin Keegan, a man who admitted to never rating Shaun Goater. 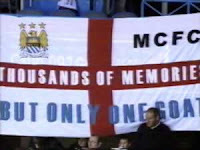 Despite this, Keegan still had the sense to play the fan's favourite and was rewarded with 32 goals - the fourth consecutive season Goater had finished City's top goalscorer. 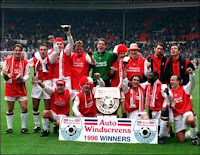 Darren Huckerby scored 26 as City hit 153 league goals in total and won the title by 11 points. This time around the Maine Road board made their intentions clear that staying in the Premier League was paramount. With Keegan at the helm City signed Nicolas Anelka for £13m and Jon Mackem for £5m. Goater stayed but his opportunities were limited under Keegan but he still scored 7 goals in 14 starts including three against arch rivals United in the two Manchester derbies, his 2nd a lob over Barthez in the final derby game to be played at Maine Road was Shaun's favourite career goal. "I suppose that wasn't the correct way to say thank you to Alex Ferguson for bringing me to England," chuckled Shaun after his two goal haul in the win at Maine Road. 2002/03 was City's last at Maine Road and Goater had decided to move on, and despite his wearisome relationship with Keegan he was asked to lead the team out in City's last ever game at their 80-yea r old ground against Southampton. Goater was adored by City's fans and his decision to look for a final move at the end of his career was one that took months of soul-searching and led to an outpouring of goodwill at Maine Road. Keegan said at the time: "I think Shaun Goater will end up coming back to this club one day, but I am not sure what he will do. He might be working with the youth or he might be manager but I think he will walk back in here one day and carry on that love affair with the fans. I hope so because they love him and I know the feeling is mutual." Goater was awarded a MBE for services to sport and young people and in the summer of 2003 moved to Reading for £500,000 signed by Alan Pardew, but Pards then left for West Ham just weeks into the new season. The move you will remember was met with much acrimony. Goater said at the time: "If he goes, it'll be very disappointing as there's a lot of respect for him." New Royals manager Steve Coppell came with different plans and set about rebuilding the squad and Goater lasted just two seasons playing infrequently but he did score 12 goals. Shaun went on loan to Coventry and at 33-years old considered quitting but eventually signed for Steve Tilson at Southend on a free in August 2005 for one last season as a pro. It was a fantastic season and one to treasure for The Goat. Southend won the League One title and were promoted to the Championship. 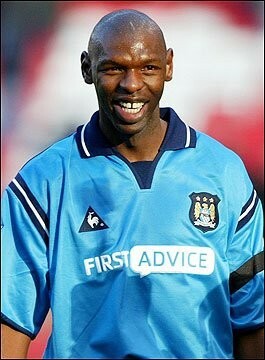 Goater played in 34 games, often partnering a young Freddy Eastwood up front, and scored 11 goals. 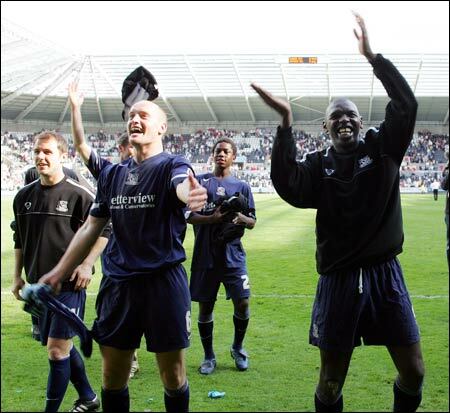 Goater's final game, his 551st, provided a fairytale end to his glittering career in England. Southend had to win to claim the league title at Roots Hall (right). They did by beating one of Goater's old clubs Bristol City 1-0 and it is said that over 400 Manchester City fans travelled to Essex on the day to serenade their hero. Bristol City fans also gave him a standing ovation afterwards. Fans also travelled from Bermuda to cheer Shaun on to spark an outpouring of love for The Goat at the final whistle. Bermuda Hogges part owner Paul Scope was also in attendance that day and when asked what makes Shaun Goater so special, he said: "British fans love his attitude, his special smile - and they love someone who takes what they have in ability and makes more of it." Goater returned home to Bermuda to an official welcome from then Prime Minister Alex Scott. Southend United also made the journey and played Bermuda's national side in an exhibition match. By the end of his 17-year career Shaun Goater had scored 260 goals plus 32 in 36 games for Bermuda's national team. Since being back in Bermuda Goater turned to coaching and giving back to the game that took him away from this island and to a career of reverence that he could never have dreamt about as a young lad kicking the ball along the street. He studied for his UEFA coaching licence as well as for a marketing degree and is currently the business development officer for local firm East End Group Ltd, a kind of mini-conglomerate on the island. Goater is also co-owner of Bermuda's only semi-professional team, Bermuda Hogges but strangely has no involvement with the coaching or management side as that responsibility falls to the Bermuda Football Association (BFA), something that clearly rankles with him: "I've applied for a number of positions at the BFA and have either been turned down or told there is no position, only for there to be a position available a few months later." It is incredulous that Goater has never been involved with the Bermudian national team, this is a man who has worked with Sir Alex Ferguson, Kevin Keegan and Joe Royle. "Outside of Bermuda people can't believe I am not involved. But who knows what will happen in the future." Meanwhile Shaun continues to coach his old team North Village, runners up in last season's Bermuda Premier League. He has often doubted the desire of young people in this country to make it is the sporting world. If it is obvious to me that Shaun Goater is the undeniable choice to change this, then I don't understand why it isn't to others.